Sally-Forth: There we were, all snuggled in the back seat of our human’s car, when she muttered something, pulled off the road, and got out. Tally-Ho: Was Willow about to take us for a walk? Naturally, we sat up. Sally-Forth: What we saw made us forget all about walking. Tally-Ho: Ouch. Don’t bark in my ear. Why’d you do that? Tally-Ho: That’s not what I meant, and you know it. Hey, don’t bite my neck! Sally-Forth: But I was just getting to the exciting part of the story. We saw dogs and people playing in a fenced-in field. Tally-Ho: I needed to get out of the car and make my mark. Sally-Forth: You always say that. The people were wearing dark uniforms. Tally-Ho: Some silly dogs want to attack people in uniforms, but we know better, don’t we, Sally? Sally-Forth: Well, some of the police officers who visit us are nice, and these guys looked like the nice kind of police officers because they were giving their dogs lots of attention and playing with them. Even wrestling! One of those dogs grabbed an officer’s arm. No wonder, too. That arm was inside an especially big and heavy sleeve. Tally-Ho: I almost barked at that! The dog hung onto that sleeve and wouldn’t let go! He was being swung around. Sally-Forth: That would be a really fun kind of wrestling. Here, let me grab your tail and see if I can swing you around. Tally-Ho: Ha, you can’t. I’m sitting on it. Sally-Forth: Spoilsport. Did you see what happened next? Another policeman told the dog to let go, and the dog did, and everyone had a nice, ear-rubbing time, and the dog got to play with a toy. Tally-Ho: Those dogs got to play some fun games! I wanted to get out of the car. Sally-Forth: Me, too. I liked it when they sniffed around and found things and got more praise and toys. Tally-Ho: I couldn’t help whining. I wanted to do that! Sally-Forth: We can. Remember helping Willow pick up litter? If she shows us what she wants us to do, we obey and get praise and toys. Tally-Ho: She gives us praise and toys, anyway. Treats, too. I didn’t see those dogs getting treats. Sally-Forth: And when Willow came back into the car, we got lots of praise for being so good. Tally-Ho: But she didn’t let us out. Someone had marked a bush by the side of the road, and I needed to mark it, too. Sally-Forth: What a silly brother. You did that the minute we got home. Tally-Ho: That’s not the same. 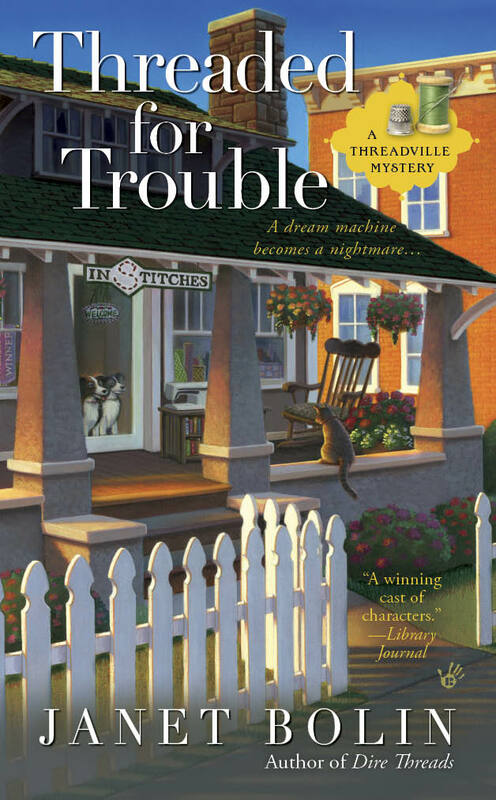 You can find out how Sally-Forth and Tally-Ho help Willow solve murders in the first two books in the Threadville Mystery series, DIRE THREADS and THREADED FOR TROUBLE. DIRE THREADS was nominated for both an Agatha Award for Best First novel and for the Bloody Words Light Mystery Award (the Bony Blithe.) 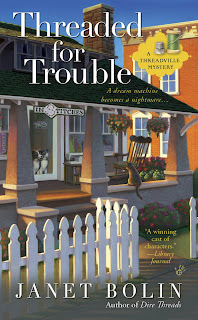 You can order DIRE THREADS and THREADED FOR TROUBLE from any bookstore or from these booksellers. Visit Janet at facebook and twitter. 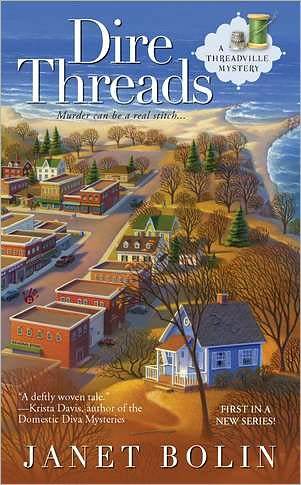 Great news--the third Threadville Mystery, Thread and Buried, due out in June, 2013, can already be preordered from Amazon! Now that sounds like a romping good time... too bad you had to miss it, Sally and Tally!! I may only have three legs, but I'll bet I could have hung on, too! 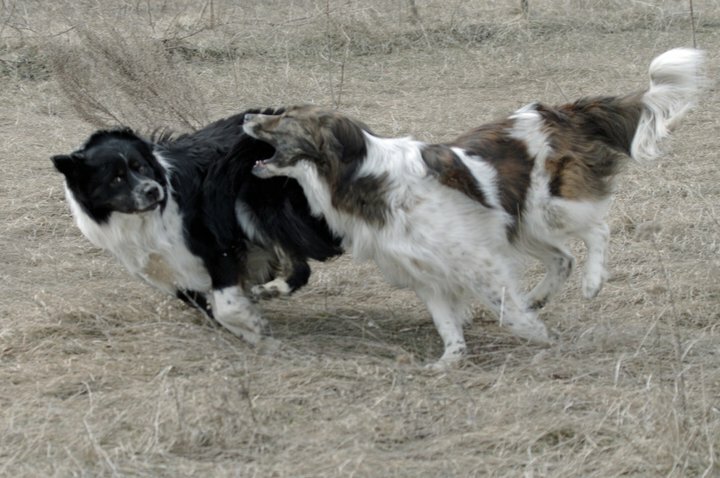 Sally: I often have to run on three legs because Tally has one of my legs in his mouth. Tally: She's sooooo easy to catch! But we'd love to play with you, Hoppy. Sally: Yes, we would, and we'd be gentle. Sally and Tally, I can remember when my doggies romped like the two of you, and chatted back and forth the same way. I'm so glad you have each other and that Willow has you! Tally: The three of us are a pack. Willow is Alpha. Sally: We could use more members in our pack. You stayed in the car? Seriously? I'd have jumped out of the window and joined the fun. I bet there were squirrels and rabbits out there, too. None here today. Maybe later. Next time, you gotta get out of the car! Sally: Trixie you sound like lots of fun, but jump out car windows? We're not allowed. And we wouldn't fit. Willow won't open the windows enough for big dogs like us to squeeze out. Sally: No. You can't. What if you and I got separated? Tally: That would be unbearable! Willow won't let us. Um, I have a problem with enclosed spaces. There's always a way out! Almost always. You just need to jump around a bunch. There are two of you -- you can probably figure out how to open the doors or windows. Another good trick is to bark nonstop. They usually come and open the doors. Just be ready to zoom by that Willow of yours. Tally: But...but Willow told us to stay. Sally: Trixie, do you like to wrestle? If you were jumping around a bunch, I could catch you and we could wrestle!